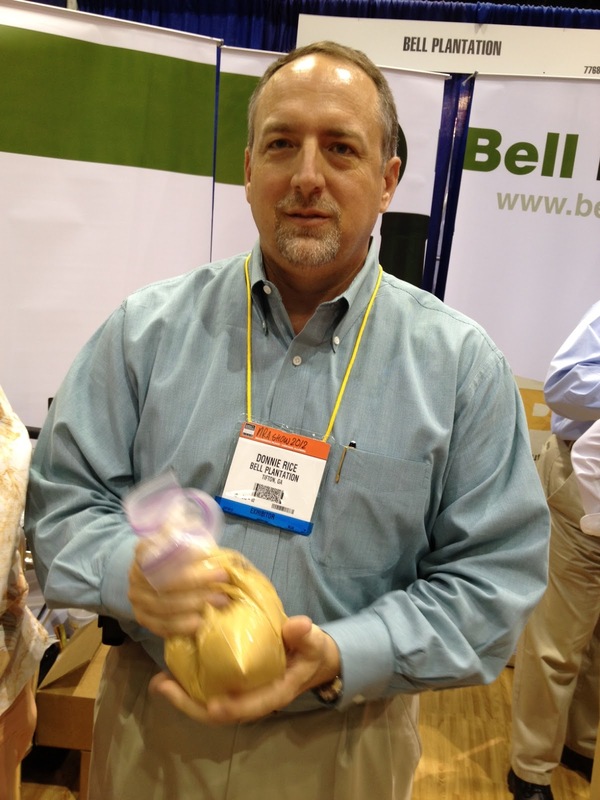 Bell Plantation‘s PB2 was one of the more interesting products fighting for attention at The National Restaurant Association’s recent annual show at Chicago’s McCormick Place. The four-year-old company based in Tifton, Ga., produces a line of peanut butter powder that can be re-hydrated and used like regular peanut butter, or stirred into recipes for a peanut taste without the fat. The powder is made by pressing roasted peanuts at very high pressure, removing most of the fat, said Donnie Rice, a spokesman. Two tablespoons of reduced fat Jif is 190 calories with 12 grams of fat. Two tablespoons of PB2 powder is 45 calories and 1.5 grams fat. With a tablespoon of water, it re-hydrates to the consistency of peanut butter from a jar. For a person on Weight Watchers, 2 tablespoons of peanut butter is 1 point on the Points Plus system. For the leader of my Weight Watchers group, this will be nothing short of a miracle. A peanut butter-and-jelly sandwich on low fat bread winds up a mere 5 points if made with PB2. At home this week, I tested a sample on toast. It had a true peanut flavor. In a side-by-side test with a commercial peanut butter like Jif, perhaps a tester like Annette Funicello might notice a difference. On a sandwich with jelly, I bet not even that choosy mother would suspect. The same goes for stirring it into a smoothie with a banana and some yogurt. PB also is offering a powder called PB2 with Premium Chocolate. Two tablespoons of the powder are 45 calories and 1 gram fat. It seems perfect for PB-and-chocoholics. Rice said that some chefs and caterers have adopted it to stir peanut butter flavor into “off the wall” recipes. On the Bell Plantation website, a 1-pound bag of PB2 costs $4.60. The company also produces a line of peanut butter crackers called PB Thins. A 22-gram serving is 100 calories and 4 grams fat. Oh, and if you wondered what happened to the fat, Bell Plantation sells that too. A bottle of the roasted peanut oil goes for $3.30. The Restaurant Dieter has a friend who’s been a restaurant critic for several major newspapers. He’s a trained chef who’s traveled widely and sampled all kind of exotic fare. One of his daughters was equally adventurous when it came to food. The other was not. Like a lot of little kids, all her preferred food groups had one thing in common: They were white. Rice, refined pasta, potatoes, sandwich bread. Like a lot of people, she probably wouldn’t touch wheat or whole grain pasta. Growing up in an Italian American household, plain old semolina pasta was a staple. We had it nearly every Sunday, and I’d never seen a noodle that wasn’t white. But in recent years, I’ve turned to whole wheat and whole grain pastas. It’s particularly great to see that more restaurants are discovering that pasta doesn’t have to be the enemy anymore. That was the message from pasta purveyors both large and small at the National Restaurant Association’s annual trade show at Chicago’s McCormick place. At the large Barilla booth, employees held a taste test showing off Barilla Whole Grain and Barilla Plus offerings. Felicia Pierce, food service manager/brand, explained that more restaurants are integrating these products into their menus. They already have wider acceptance in schools, where school lunch guidelines necessitate better-for-you pasta. In a 2-ounce serving Barilla’s regular pasta has 2 grams of fiber, 7 of protein and 42 carbohydrates per serving. But Barilla Plus offers 4 grams of fiber, 10 of protein and 38 carbohydrates. And Barilla Whole Grain has 6 grams of fiber, 7 of protein and 41 carbohydrates in a serving. 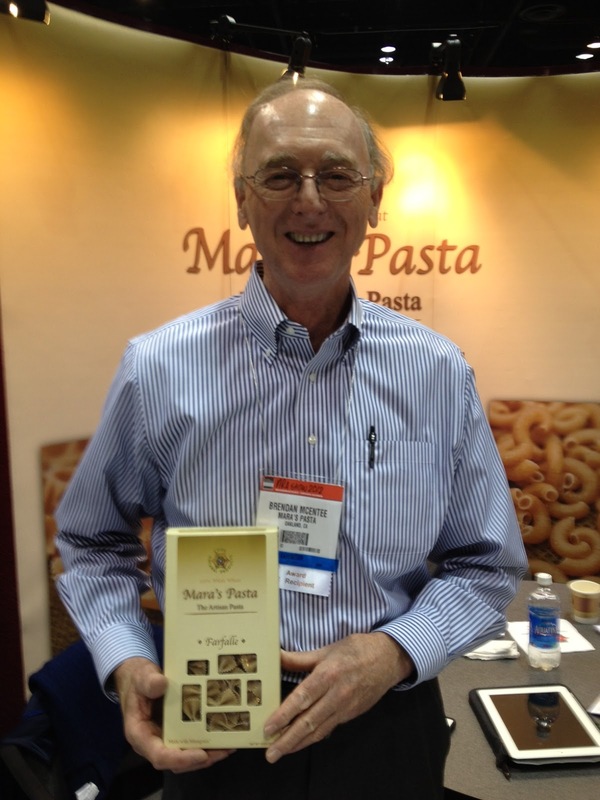 More intriguing was a pasta that won one of the NRA innovation awards from Mara’s Pasta of Oakland, Calif. A 2-ounce serving has 7 grams fiber, 8 of protein and 40 carbohydrates. If the green, locavore, farm-to-table, organic crowd could have just one enemy, it would surely be the food giant, ConAgra Foods. The Omaha, Neb., food giant represents all that is wrong to them. The company’s Wikipedia page offers a pretty good inventory of the issues. ConAgra was, however, one of the winners of the National Restaurant Association innovation awards, cited at the annual show that recently concluded at Chicago’s McCormick place. 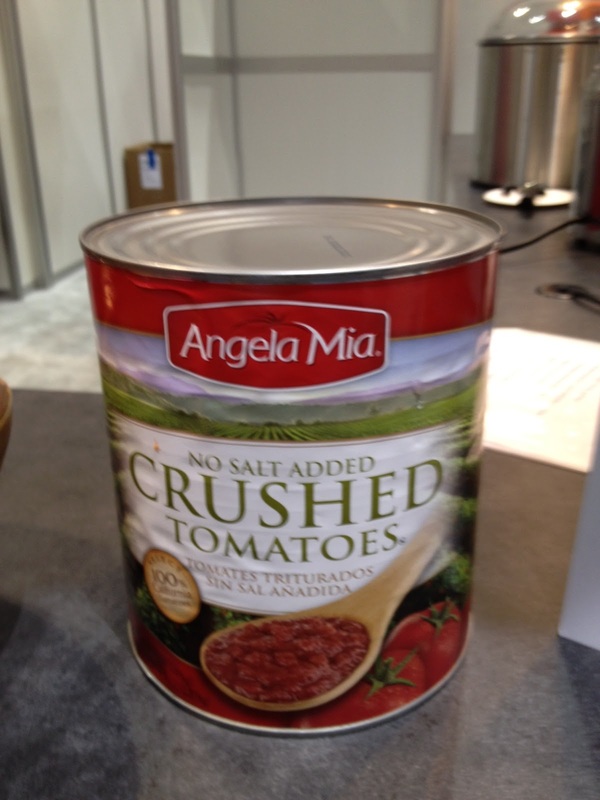 The award was for its Angela Mia no-salt-added crushed tomatoes. Cindy Bombacino, director of category marketing, said the company arrived at the product by querying its restaurant customers about reducing sodium content. They replied that too many other restaurants products have sodium. Better to get rid of it altogether, so that’s what ConAgra did. 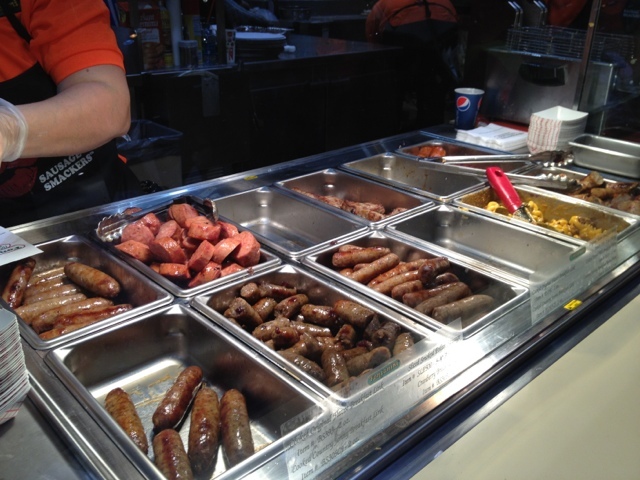 As noted before, the sodium content in some meals is obscene. One Olive Garden lasagna entree has more than double the daily amount recommended for a person over 50. I don’t know if that totally qualifies as innovation, but it’s at least something. Can you imagine how many calories and grams of fat and sodium there is in this stuff? It was all part of an enormous booth at the National Restaurant Association show in Chicago by Fontanini, a supplier in McCook, IL. The Restaurant Dieter is second generation American of Italian extraction. He has traveled in several parts of Italy. 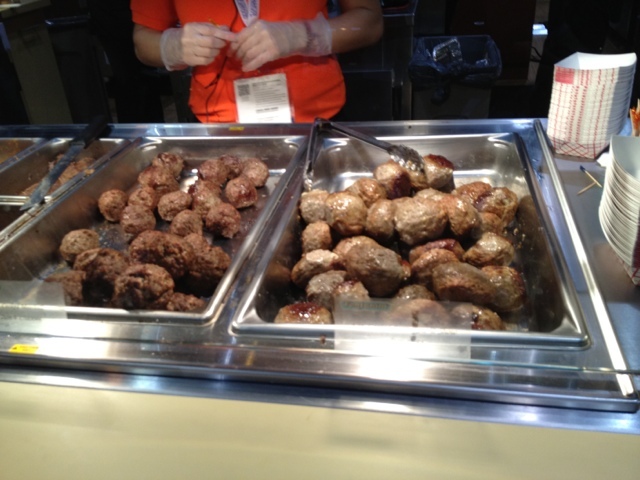 It’s unfortunate that the American interpretation of Italian food has become so concentrated on high-fat meat. Meat is expensive in Italy and many more dishes celebrate seasonal vegetables. Beans are in many dishes, including pastas. That was the Italian food I learned to love at home. Something got lost in the translation, and it’s making us fat. Baskin-Robbins announced a new ice cream cone product that follows the smaller serving trend, according to Nation’s Restaurant News. Called Baskin-Robbins Mini Cones, they range from 35 to 100 calories, depending on the flavor selected. They’re offered in customizable packs of 16 cones or pre-made using Mint Chocolate Chip, Very Berry Strawberry, Gold Medal Ribbon and Rainbow Sherbet. 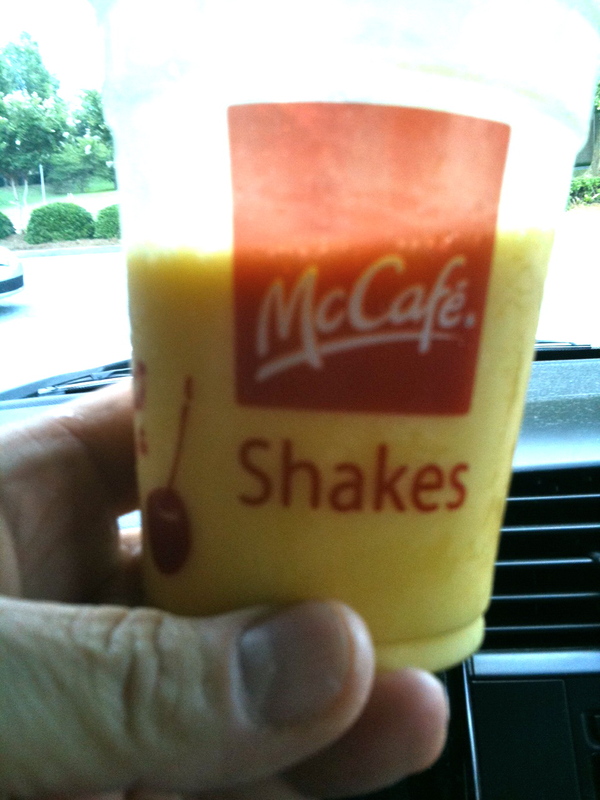 McDonald’s introduces new Mango Pineapple Smoothie. That led to a decision to try one sometime. Which led to a decision to try one on my commute home. Which led to a decision to trust an entire day of exercise and healthy eating to McDonald’s. All of which leaves me sitting here at my laptop, about to find the McDonald’s website and assess the damage. It leaves you, dear reader, likely wondering if this whole Restaurant Dieter thing is a total fraud. He didn’t, did he? I’ve mentioned before that I count points via Weight Watchers’ Points Plus program. After work, I arrived at the Golden Arches having consumed 17 of the 37 food points I can eat each day. I also accumulated 5 points I could use from 50 minutes of weight lifting this morning. OK, counting now. This is exciting; you’re going to see this drama unfold — live. To Mickey D’s credit, the website is excellent, with search functions that make it easy to find the nutritional information one needs. The smoothie is 220 calories and 1 gram of fat, which doesn’t sound too bad. That is, until you look at the grams of carbohydrate — 49 in this case. 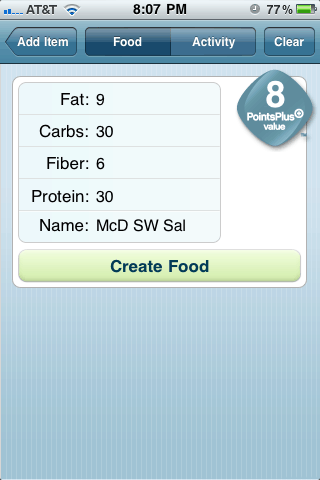 Weight Watchers’ easy-to-use Points Plus system awards lower point values for proteins, fruits, vegetables. But you get dinged for carbs and sugars, especially if they are not high fiber. Perhaps my entree — the Premium Southwest Salad with Grilled Chicken — will save me. It clocks in at 320 and 9 grams of fat, which sounds pretty good. Oh yeah, I did put some dressing on it. Let me dig that packet out of the trash. 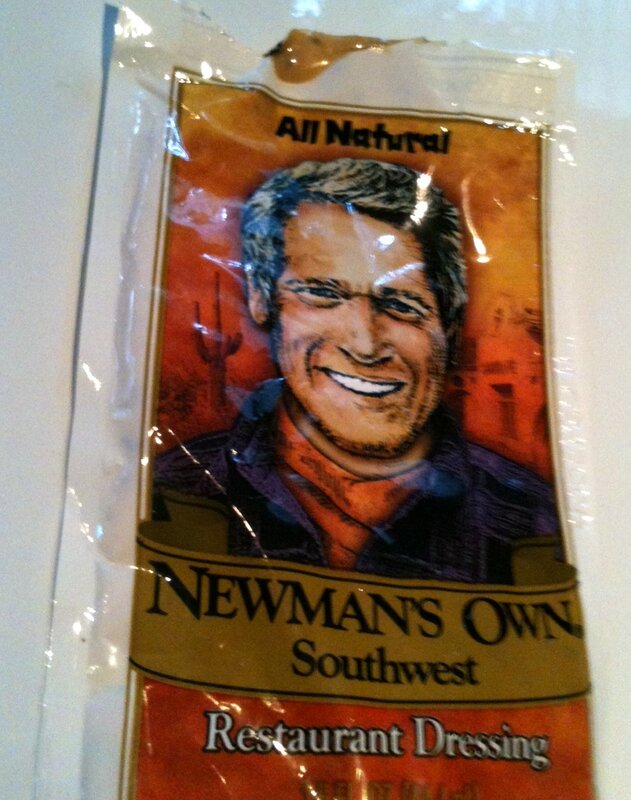 It’s a Newman’s Own dressing. Paul was a good guy, a liberal, leftie type who is probably in favor of “the mommy state” taking care of our health. I’m sure those piercing blue eyes would never do me wrong. The entire pouch of dressing is 100 calories and 6 grams of fat, which is higher than I’d like. Salad (8) + dressing (3) = 11, so I’m at 34 for the day. I can have my ice cream. I’m pleasantly surprised. You’d have to count the McDonald’s dinner a winner in most respects — except, of course, for the sodium content: 340 mg in the dressing and 960 in the salad — close to the 1,500 a person over 51 should eat in an entire day. That salt content is also alarming because of its addictive properties. The danger is not in what I already ate — but that craving for salt that begins a binge. Time to go brush my teeth and hope for the best.